Whhooooooohooo !!!! Did that get your attention ! I have been busy making these for a swap on splitcoaststampers. 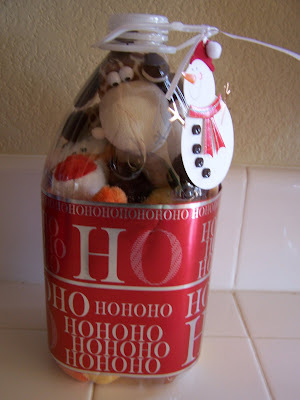 There was a dollar limit and we have to mail these on Dec 15 to a name that we received. It is sort of a secret sister swap. We have a lot of ladies playing and this was totally my idea. I am sure the post office workers are going to go crazy. 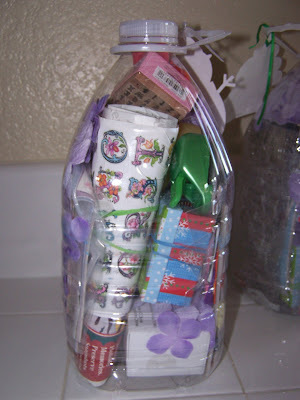 The idea was to mail all kinds of scrap booking goodies in any sort of a container and it cannot be placed in a box or wrapped. I chose a one gallon water bottle. I made three of these so I have had to drink a lot of water. Three gallons in three days. Yes I spent a lot of time tinkling at the white house. If you are from the swap on SCS then this is what you may or may not receive. Only two of you will get this. Leave me a comment if yo uthink it is you and if you guess right I will send you a little something extra seperately for being so naught as to peek. LOL !!!! This was so cute and Pravan suggested we make one for his cousin Addison who is so adorable and only 18 months old. 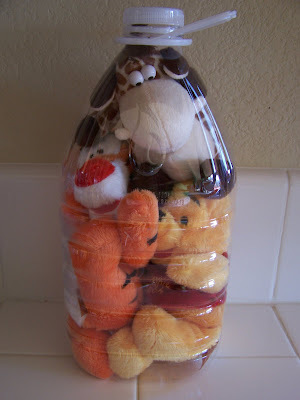 He and Priyasha bought her some stuffed animals and we packed them in the bottle as well. Hope you like them and you should give it a try. 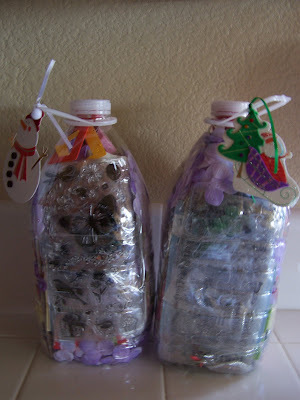 All you do is empty out a bottle, cut a rectangular opening in it and stuff. Seal shut with clear tape and conceal opening with address label. Then mail to a friend and see if they can figure out how to get into it. Have any questions, post me a comment and I will try to help you out. For my neice. Filled with stuffed animals. Partly wrapped with gift wrap. Sort of looks like a coke wrapper. this is very clever! I am amazed. I am trying to think if there is anyone I know that would appreciate something like this. Will the post office let youmail things like this? What a wonderful project and gift too! How fun for your children too!